The picture sleeve of the 7" single features a brownish black and white group picture (Pål, Mags & Morten) by Just Loomis with the a-ha-logo at the top in light purple and the title in white at the bottom. The reverse of the sleeve is white with 3 small brown and white pictures of the band, the tour dates of the first leg of the 1988/89 World Tour in black and the tracks written in purple. 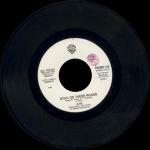 The 7" includes the "Original Version" of "Soft Rains Of April" (3:15). As with many of the 7" singles, there are versions available with different coloured labels including white and silver. 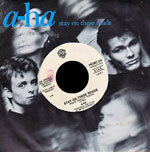 The 12"-release has the same cover as the 7" except for the text "(Extended Remix)" written under the title and the "a-ha" logo is blue instead of purple. The 12" features the "Extended Remix" of "Stay On These Roads" (6:14) mixed by John Hudson. Some copies of the 12" come with a limited edition poster. 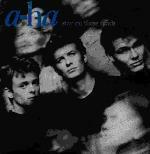 The 22"x22" poster is a black and white group-shot of a-ha in front of an old fashioned microphone (Pål, Morten and Mags) by Just Loomis with a pale blue a-ha-logo in the bottom left corner. There is also a limited edition 12" picture disc which is white with a picture similar to that of the 7" and 12"-releases with burnt edges and titles written in blue. The back of the disc is light grey with the black and white picture from the front of the 7" picture sleeve. Underneath it the tracks and UK Tour 1988 dates are printed in blue. 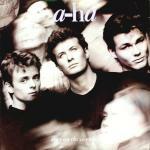 For the first time in the UK, there is an a-ha CD single available. It is a 3" CD with a 5" white adapter which comes in a 5" jewel case. 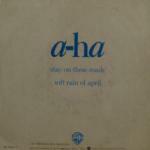 The front cover is similar to the 7" but with a blue a-ha-logo. The back of the insert is white with black titles and the tracks written in purple. 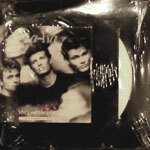 The German made CD is silver with black a-ha and WB-logos. The tracks on the CD single are all album tracks except for the original version of "Soft Rains Of April". There was a promo package of the 3" CD single which comes with a car care kit. The kit includes a FEU Orange car freshener, car compass, stay clean kit, blue ice scraper and cleaning cloth. 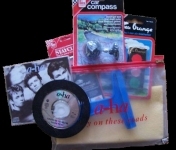 The kit comes in a clear plastic case with a red zip and red text "a-ha Stay on these roads". There is also a promotional 3" CD which comes in a 3"x3" card gate-fold sleeve with the same cover as the regular CD-single but with a white circular "Promotional copy only not for resale" sticker on the front. It comes fixed to a 5"x5" piece of cardboard which houses the 5" CD adapter. It features the same tracks as the regular 3" CD and has the same catalogue number. The inside of the insert features 3 additional black and white pictures of the band. Argentina: There is a 7" promo which comes in a company sleeve. The a-side "Stay On These Roads", written as "Quedate En Estos Caminos", and the b-side Rod Stewart's "Lost In You" are featured on this release. Australia: The 7" sleeve is similar to the UK 7" but there are no tour dates printed on the back of the sleeve. Brazil: There is a 4-track 12" promotional disc which features other artists, it comes in a There is a promo 12" which comes in a yellow and dark red WEA title sleeve, similar to that of the Touchy! Brazilian promo 12". Canada: The 7" has b-side "You'll End Up Crying" and comes in a white WEA sleeve. The promo edition also comes in a white WEA sleeve and has "promo only not for sale" printed in the record label. France: The sleeve of the French 7" has the French tour dates in a black box on the back and the sleeve is side-opening. 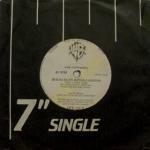 Some of the copies of the 7" have a promotional sticker of "SCNF" (the sponsors of the French part of the 1988 tour). Italy: The 7" has the same cover picture as the UK 7" but it is printed in black and white and has "a-ha Stay On These Roads" in blue at the top of the cover. The reverse of the sleeve is grey with the "a-ha" logo in the centre and the tracks written underneath, both in blue text (note: the 's' is missing off the end of the word "Rains"). There is also a 7" juke box promo with b-side Miguel Bose - "Lay Down On Me" which doesn't have a picture sleeve. The disc label is white with black wea-logo and track information. As with most juke-box releases, the disc has a large cut-out hole in the centre. Some of these juke-box come in the regular Italian "Stay On These Roads" sleeve with a large juke-box hole cut through the sleeve through which the labels can be seen. Japan: The 7" has a picture-sheet similar to the cover to the UK 7" except that it is black and white rather than brown and white. The "a-ha" writing is light blue and purple and there is white and red Japanese writing on the sleeve. 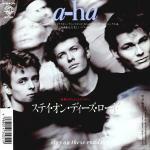 The back of the insert is black and white with a picture of a-ha with guitars, a small picture of the album "Stay On These Roads" and the lyrics for the single in English and Japanese. 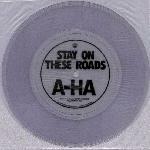 The German made 7" of "Stay On These Roads" was also used for promotional purposes in Japan. These promotional copies have a white sticker on the front of the sleeve with what seems like hand written Japanese black writing. There exists a rare "Stay On These Roads" 7" one-sided clear flexi disc. 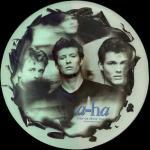 In the centre of the disc the title and a-ha logo are printed in large capital letters. The disc comes in a paper sleeve. 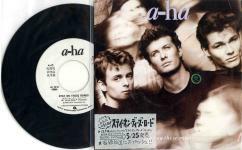 For the first time there is an a-ha 3" CD released in Japan. It comes in a 3" by 6" snap-pack, the front of which has a top half identical to the UK single and a bottom half of dark navy colour with a large light purple a-ha-logo with red and white Japanese text below. The reverse is light purple with black text including the lyrics in English and Japanese. There is also a tiny black and white picture of the "Stay On These Roads" album. 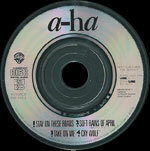 The CD is silver coloured with black titles and a-ha-logo and red WB-logo. Portugal: The 7" sleeve is basically the same as the UK sleeve. However the front is noticeably much browner with blue and purple "a-ha" while the back is all in black and white. The time written on the 7" for "Soft Rains Of April" is 4:12, but it is the same version as featured on UK copies. South Africa: The South African 7" has a picture sleeve which is similar to the European release. USA: The front of the U.S. 7"-release is identical to the UK edition, while there are a few differences concerning the reverse. The tour dates for the European leg of the World Tour 1988/89 have naturally been omitted while the three photos are identical. Only "Stay On These Roads" has been listed as a track and is printed in purple handwriting across the mid section of the reverse. A major difference is the selection of the album version of "You'll End Up Crying" as b-side. Another difference is that the version of "Stay On These Roads" found on the 7" is an edited version (3:50) although this fact is not mentioned on the sleeve. The promo 7" has the same cover, but features an edit version of "Stay On These Roads" (3:50) on both sides of the record. Brazil promo Stay On These Roads + 3 tracks by other artists WEA #14 / swp.no17? Spain Stay On These Roads (Extended Remix) // Soft Rains Of April (Original Mix) 920 901-0?